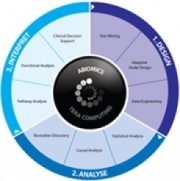 Abiomics proudly present their technology platform that offers information management and artificial intelligence tools to enhance the whole workflow of systems biology and “omics” research. Abiomics participates in the project Ageing with elegans. The project is funded by the European Commission under the Horizon 2020 Research and Innovation programme based on a collaboration of thirteen academic research groups and four companies from thirteen EU and three non-EU countries (Switzerland, USA, and China).